At one of my courses, one participant told me about a poem she did with her class called, "In a Moment of Silence," inspired by a clip from the TV science series "Bang goes the Theory" where they recorded the sounds of centipede, snail and maggots in a special echo free room. The presenter used a simile when he described the maggots sounding like a bag of crisps rustling around the world. Inspired by this, I tried it with my P7 class.We went to the woods to find as many creatures as we could. 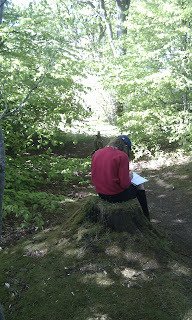 They loved it and came up with some lovely poems but it was great to see older children so enthusiastic about small creatures and they were so careful with them and their habitats. 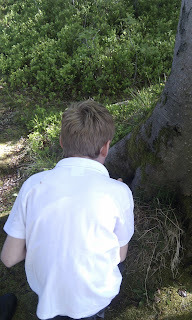 Looking for creatures in tree holes - this one was full of slugs!